Remember the frenzy that erupted about a year ago when Eric Holder announced that the mastermind behind 9/11, Khalid Sheikh Mohammed ("KSM"), would stand trial in...wait for it....wait for it...New York's Federal Court *gasp* [dun dun DUNNNNNN!!!!]. Certain people *cough*conservatives*cough* said there is no way in hell we could possibly hope to try terrorists in "civilian courts." According to these folks, Terrorists (or rather, people accused of Terrorism) belong in Military Tribunals because they are terrorists and terrorists don't deserve any Constitutional Rights. And furthermore, if we try the terrorists in "civilian courts" and "lawyer them up" with "Constitutional Rights" the world as we know it will certainly come to an end. There will be human sacrifices, dogs and cats living together...mass hysteria!! As usual, when we inconvenienced the "mass hysteria" talk with facts, it all fell apart. It turns out that the so-called "civilian courts" are actually called Federal District Courts, and these Federal District Courts have a pretty damn good track record of trying and convicting terrorists. (see Ramzi Yousef; see also Zarcarias Moussaoui; see also Jose Padilla). It also turned out that, in all the years since GW established the infamous Military Tribunals at Gitmo in 2001, these Military Tribunals have convicted a whopping number of....three (3) terrorists. Not three-thousand. Not three-hundred. Just plain old three...as in that number that comes after two and before four (that's a 1 terrorist for every three-year average and that's so laaaaaaaaaaame!!!). At the time Eric Holder announced that KSM would face trial in New York's Federal District Court, One-Hundred Ninety-Five (195) terrorists suspects had been tried and convicted in Federal District Courts. 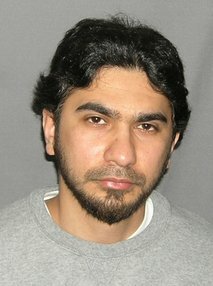 So it should come at no surprise today that 31-year-old Faisal Shahzad received a life sentence without the possibility of parole in New York's Federal District Court for the attempted terrorist attack in Times Square in May earlier this year. The Pakistani immigrant who tried to detonate a car bomb on a busy Saturday night in Times Square accepted a life sentence with a smirk Tuesday and warned that Americans can expect more bloodshed at the hands of Muslims. "Brace yourselves, because the war with Muslims has just begun," 31-year-old Faisal Shahzad told a federal judge. "Consider me the first droplet of the blood that will follow." His punishment for building the propane-and-gasoline bomb and driving it into the heart of the city in an SUV last May was a foregone conclusion, since the charges to which he pleaded guilty carried a mandatory life sentence, which under federal rules will keep him behind bars until he dies. But the former budget analyst from Connecticut used the courtroom appearance to rail against the U.S., saying the country will continue to pay for occupying Muslim countries. "We are only Muslims ... but if you call us terrorists, we are proud terrorists and we will keep on terrorizing you," he told U.S. District Judge Miriam Cedarbaum. Shahzad — brought into the courtroom in handcuffs, and wearing a long beard and white skullcap — had instructed his attorney not to speak, and Cedarbaum told prosecutors she didn't need to hear from them. That left the two free to spar over his reasoning for giving up his comfortable life in America to train in Pakistan and carry out an attack authorities say could have killed an untold number of pedestrians. "You appear to be someone who was capable of education and I do hope you will spend some of the time in prison thinking carefully about whether the Quran wants you to kill lots of people," Cedarbaum said. What are your thoughts on Federal Courts vs. Military Tribunals? Did Shahzad receive a fair sentence? What do you make of his threats that more attacks will come to the U.S.? Can we try KSM now in the same Federal District Court that just convicted Shahzad or do we need to have another discussion about it?